Posted November 9, 2003 by Emmet Farrell in News. The ever expanding village of Claregalway is to have its own hotel and leisure centre within the next 6 months when the €7 million development will open its doors to the public. Already bookings are being taken for the new Claregalway Hotel which is a 48 bedroom facility with conference centre, while it also hopes to make a major impression in the weddings market. The new hotel is currently under construction and it is hoped that the official opening will take place around St. Patrick’s Day. And the management at the hotel are confident that it will provide a convenient alternative for couples in the North Galway area who regularly have to travel to Galway city or further for their wedding reception. 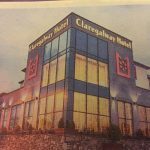 In the absence of a hotel in the Tuam area, couples from North Galway often have to travel long distances for their receptions and now the Claregalway Hotel operators are confident that they can tap into this market. The hotel which is being constructed by GK Developements, will have both a modern and old style bar, a health and fitness club which will include an 18 metre swimming pool, sauna and jacuzzi, a conference centre which can accommodate 400 people and a banqueting room which caters for 300. General Manager, Paul Gill, said that it was an exciting new development for Claregalway and they had received a very positive response from local residents to the hotel. At the moment there is an intensive marketing initiative in place to establish bookings for 2004 and Mr. Gill said that they were encouraged by the number of inquiries that they had received to date. “ We believe that it is ideally located in that it is very close to Galway city and will also be serving the whole of North Galway which doesn’t have such a facility available to them”, he said. Mr. Gill, who worked for seven years in the Ardilaun Hotel in Galway, said that they also have had a number of inquiries from tour operators which augers well for the summer months next year. The new hotel, which also has 180 car parking spaces, is offering a 20 percent discoun to couples who book their wedding in 2004 as part of their opening offers. 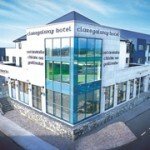 Mr. Gill, who also worked in the Connemara Coast Hotel as well as hotel in Zurich, said that being located at the junction of the N17 and N18 it was also convenient for tourists flying into both Shannon Airport and Knock Airport. “Plans are going according to schedule and we hope to have the hotel open for St. Patrick’s Day. 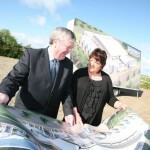 It is a major development for the Claregalway area and we are confident that it will provide a significant boost to what is a growing village,” he added. Migraine is a common neurological condition, characterised by a severe, pulsating, normally one-sided headache. There are associated symptoms such as nausea, vomiting and intolerance of light and sound. These symptoms usually precede the headache in what is called the ‘aura’ stage, which affects about 20-30% of sufferers. Aura is caused by electrical and chemical changes in the brain as well as reduction in the flow of blood to parts of the brain. Aura is not only visual; sometimes it causes motor weakness or sensory disturbances e.g. pins and needles. Common trigger factors include diet, hormonal or physiological, physical, emotional and external e.g. flickering bright lights, intense smells, change of climate. Tips to reduce the chances of an attack; keep a diary of possible triggers. Once identified avoid triggers where possible. Consider what was eaten and what happened in the 48 hours preceding a migraine. Eat regularly, get enough sleep, and drink plenty of water. Limit your intake of drinks containing caffeine or alcohol. Take regular exercise; get plenty of fresh air and practice relaxation techniques. Tips to reduce the discomfort of symptoms during an attack; Take appropriate medication at the earliest possible point, i.e. as soon as you know it is a migraine. Rest or sleep in a dark quiet room. To alleviate nausea, take over the counter medication or small snacks at regular intervals. For some, applying hot or cold compresses to the side of the head alleviates the pain. To manage migraine in your life it is first important that your doctor establishes a diagnosis of migraine. If your migraine is not manageable with OTC preparations, there are specific migraine prescription drugs available which may be beneficial. Birthday wishes to Mary Duggan, Montiagh, who celebrated a very special birthday in October. A great night was had by all we believe!! Birthday wishes to Bridie Reilly (Raftery’s Centra) who also celebrated a very special birthday recently and had the pleasure of Galway Bay Radio Station calling to Centra especially to wish her well!! 21st birthday wishes to Catherine Lyons, Cloonbiggeen, who celebrates her b ig day on the 25th November. Hope you have a great day and night Catherine!! Congratulations to Coman Duke, Cregboy, who received his H. Dip. in Belfield College, Dublin recently. Best of luck in your T.E.F.L. course also Coman. Congratulations to Ailish and Colm Griffin, Gortatleva on the birth of their baby daughter Alanna, a sister for Patrick and Erica. Welcome to Anne and Paul Walsh and daughter Ruth to their new home in Lydican. Wishing you all many years of happiness. Now that winter is here, the temperature climate is much colder, the wind howling and the rain beating punishingly against our face, the elements fail to display even an ounce of mercy. When you feel that your skin and body are falling to bits, it always seems so much of an effort to even begin to think of getting yourself together again. The solution: – let someone else do it. Winter is the perfect time and provides the perfect excuse for engaging in feel-good and with Christmas on the way, it’s the ideal time for self indulgence. Facial treatments involve a thorough cleansing of the skin followed by a proper indepth analysis before the treatment begins to allow the therapist to decide, with you, which treatment would be the most appropriate for your skin type. Sothy’s Institute Treatments – whatever your individual skin type, every skin reacts to the passage of time by ageing. To respond efficiently to the need Sothy’s have devised their own “Institude Treatments” combining carefully selected active products with high performance methods of treatment. Camellia Debbie – Wonderful large double pink flowers from early Spring until early summer. Excellent garden shrub with glossy green foliage smothered in bright pink flowers from February onwards – Great plant in containers with mixed violas planted underneath. Camellia Anticipation – Another superb camellia variety that flowers reliably each year. This plant flowers in abundance, the stems are covered in flowers from early spring and remain in flower for long periods. Wonderful in containers or planted directly into well prepared soil. Camellia Les Dury – One of my all time favourite camellias, the flowers are produced early in the season in bunches covering the stems and foliage. Les dury flowers well into late spring and again is an excellent camellia for pots & containers. Pittospornum Tom Thumb – offers you wonderful evergreen foliage on a compact and easy to grow plant. The glossy foliage is green in spring turning to a dark purple during late spring and summer. Tom thumb makes an ideal border shrub, perfect in containers or small shrub beds. Its hardy and so easy to grow. Pittospornum Varigata – Bright foliage. Beautiful bright easy to grow shrub, this is one for all you flower arrangers, the foliage is bright green with white variegation. Very bright and colourful. It will grow to eight feet making it an ideal medium to large shrub. A great garden plant for autumn foliage colour, the leaves in October turn a magnificent red and orange combination. The complete shrub turns a flame orange colour offering excellent colour for existing shrub borders. Euonymous elatus is also one of the easiest plants to grow in the west of Ireland. Superb foliage colour. To add colour in the centre of a container for winter and spring choose the beautiful cordyline red star, the foliage is deep red all year round and contrasts well to bright yellow pansies or violas. Cordyline red star is easy to grow and loves to be grown in a container – plant one now into a patio pot for an excellent display this winter. Dwarf ornamental grasses make a refreshing change in any garden, they are easy to grow offering wonderful foliage colour all season long. Plant in groups of the same variety for a stronger bold effect. Ornamental grasses will grow in all soil types and are happy in the shrub or rockery borders and in planted containers. Winter heathers offer you both long- lasting flower colour and complete hardiness. They are now available in a wide selection of both flower and foliage colours suitable for all soil types. Look for some great varieties like Erica Kramers red, Erica Myreton Ruby, Erica White perfection and many, many more great flowering varieties. Remember winter heathers will grow in all soil types and are at home in borders or containers for great winter and spring colour. Plant winter heathers in groups of the same variety to create carpets of strong colours. The vaccinium is truly a wonderful collection of great garden plants. They offer your wonderful foliage, flower and winter berry colour. Vaccinium Cowberry is low growing and is covered in white flowers in early spring, the bunchs of red berries start in August and colour right through the winter and spring. Great plant for planted containers or shrub borders. Three of my own favourite Phorniums are: Jester with its multi coloured foliage is ideal for planting into containers or large patio pots to reward you with great foliage colour all year round. Phornium Bronze Baby has deep bronze foliage on a compact shaped plant. Bronze baby is wonderful for shrub borders to contrast against bright foliage plants like escallonia gold Brian, or choisy sundance. For a bright contrast choose Phornium tricolour – the foliage is very bright and contrasts nicely against darker foliage plants like pittospornum tom thumb or cotinus royal purple. Phorniums are very hardy plants ideal for the west of Ireland conditions. For strong sweet scent with great glossy green foliage plant Sarcocca in containers or shrub borders. This great garden plant offers you the very best winter scent. The foliage is evergreen, very glossy and the white flowers are produced from mid winter to late spring. You can cut the stems of Sarcocca and place in a small glass of water the flowers will open and revel the beautiful sweet scent. Heleborus is a beautiful free flowering border plant which produces its wonderful bright blooms from January onwards. Excellent in borders and containers. The foliage on this variety is of a blue green hue and produces masses of flowers in mid winter and spring. Easy to grow plant suitable for all gardens. Beautiful winter and spring border shrub, the foliage is evergreen and this particular variety produces a mass of white flowers in spring followed by deep black berries in winter. The foliage is scented. Wonderful plant suitable for containers or shrub borders. Evergreen golden foliage, bright pink flowers and superb hardiness, this easy to grow border shrub is extremely hardy and so easy to grow. It is ideal for windy seaside gardens and offers wonderful winter and spring colour in any garden. Plant in groups for strong bright colours. Why do whole legions of unrequited eejits hurtle along the Cregboy road at breakneck speeds? I’m not really bothered if they are acting out some long suppressed death wish in respect of themselves; what bothers me is the potential for serious damage to our children and ourselves as we comport ourselves in a dignified manner struggling to make our way through life. The road is fairly obviously unsuitable for speeds much in excess of 25 mph, with a number of ‘blind’ corners and limited vision of oncoming traffic. The road is 1.4 miles in length from the N17 to the Claregalway-Oranmore road. Travelling at 25 mph it would take just over 3 minutes to complete the journey. Travelling at 40 mph it would take just over 2 minutes. Is that 1 minute worth all the risks to residents and their children, let alone to the eejit him/herself? There is some evidence to suggest that truck drivers use the road as a short cut on occasion and they are notoriously bad at making way for humble car drivers. This is presumably because they have inertia and kinetic energy on their side, i.e. in an impact, they win! What chances might there be to have speed ramps installed? I can think of no other legal speed control measure that could usefully work on the Cregboy Road. Hello and welcome to you all. This month we have a lot of interesting articles for you to peruse, from gardners world to recyclying to interior decor to skin care et al, not to mention our gripe corner! The latter has proved hugely popular – a lot of gripes out there. Keep them coming. Perhaps they can be condensed and sent to higher authorities! Recycling is on the increase thankfully all the time and it is good to see initiative being taken locally. Reading the papers recently I saw where the government were called to provide a range of facilities for teenagers as an alternative to drinking. At the annual Dail na nOg conference in Dublin recently the delegates demanded leisure centres, discos, youth clubs and other alcohol-free activities. Minister for children Brian Lenihan promised that the recommendations would be followed up. We are lucky to have a Leisure Centre in Claregalway which is well utilised. We are also lucky to have a football pitch (with flood lights) and enthusiastic coaches to encourage our children to participate in fitness, etc. It is those coaches who give up of their time to help children reach their potential that merit praise. We have a lot of “hurlers on the ditch” – they who are so wise, they know it all! Put them out there and what do they know? For all you newcomers to Claregalway, you are welcome, and more welcome if you become involved in what’s happening in your community. A written request has been made to the NRA in Dublin to provide a representative to attend an open meeting in Claregalway to discuss the urgent need for the Claregalway Bypass. You will be informed in plenty of time of the date for this meeting and it is important that as many people as possible attend. As a result of representations made to me I have written to Galway Co. Council outlining the demands of the residents living on the Galway Road, Claregalway with regards to the provision of footpaths and public lighting and improved traffic flow at the church junction. The matter of speeding and dangerous driving on the roadway between Cregmore and the junction of the Claregalway/Oranmore road is of very serious concern to the residents living along this roadway. I have raised the matter with the County Council and they have agreed to look at the question of both calming measures and a white line on parts of this road. The question of the 60 MPH on the Tuam/Claregalway Road at LoughGeorge was recently raised by me with the Roads Sub-Committee and they have agreed to look very seriously at introducing a special speed limit extending on the North side to the junction of the Roscommon Road and on the west side of Terry Brennan’s Tavern. This would make this a very dangerous stretch of roadway much safer and people would then be able to cross this very busy road in safety. An off peak bus service for the Claregalway, Lackagh, Cregmore and Carnmore area has been requested and a letter has been sent to Bus Eireann. Deputy Noel Grealish and I are now waiting for a meeting with the Area Manager. We are also looking at the possibility of Bus Eireann providing a workers bus serving this area as well. Many parents in the Claregalway and Carnmore area are sending their children to the Oranmore Secondary School and have requested that I explore the possibility of Bus Eireann providing a school bus service. As it is, the parents have to either engage a private bus or drive the children to the school themselves at great cost. In this regard I have written to the schools transport section of Bus Eireann and have been told that they are completely stretched at the moment financially. Since then Deputy Noel Grealish has forwarded a letter the Minister for Education and he is having the matter checked out through Sile De Valera, Minister of State and the County Galway VEC. In October, another milestone in the history of Claregalway was passed as the well-known city centre restaurant Royal Villa opened an outlet in the village. In 1991, Charlie Chan took over the Royal Villa restaurant in Shop Street in Galway, having been head chef in the Dragon Court in Foster Street for three and a half years prior to that. 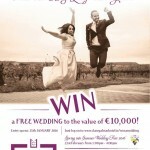 Since then the Royal Villa has received great acclaim, and has featured in many guides to excellent cuisine in Galway. The decision has now been taken to open an outlet in Claregalway, one of the fastest developing areas around the greater Galway city area. The management is the same as the city centre outlet. Despite an uninspiring entrance to the new Royal Villa Restaurant in the Hughes complex, once inside, the ambience is excellent. Although the table area is quite large, clever use of dividers and the table layout makes for a relatively intimate atmosphere. The fare on offer is extensive (and, for the unadventurous, includes honest to God steak and chips!) and wide-ranging including Chinese, Thai and Malaysian cuisine. The starters range from Honeydew Melon to Charlie’s Platter for two (price range from 4.00 to 20.00), with a range of soups from 3.50 (mixed vegetable) to 5.00 (Mee Hon Broth with Prawn). Main courses range in price from 10.00 to 17.00 and cover an enormous range including my own personal favourite, Nasi Goreng, which is a spicy fried rice dish variously described as Indonesian or Malaysian (I frequently make it myself). Charlie’s version is exquisite though quite mild. Some of the dishes are described as Malaysian Sambal Beef (or Prawns or Chicken) or Sliced Sambal Duck. These dishes are made with Sambal Oelek, a sort of chilli paste widely used in the Far East and exceedingly tasty. Courses sampled thus far by the reviewer, his spouse and some colleagues both in the restaurant and at a subsequent take-away session included: Thai Hot Chilli Chicken, Sweet & Sour Chicken, Prawns with Cashew nuts, Szechuan Duck, Special Chow Mein, Nasi Goreng. Without exception, all were excellently prepared and presented. Service is first class. A classic example of this can be cited: I rang and specified 7.20 pm as a collection time for a takeaway. I arrived at about 7.17 pm and the freshly cooked selection was available on the dot of 7.20! Wise to book at weekends. The place deservedly gets very busy. Highly recommended. A very successful bag-packing was recently held in Dunnes, Westside. All monies collected are in aid of the running costs of the Centre. The committee would like to thank all those who helped with the bag-packing, especially Mary and Pat Forde, who packed both nights and again on Saturday. A special word of thanks for all the teenagers who showed up, particularly from the badminton club. The costs of running the Community centre are considerable, and every bit of fundraising helps. Users of the Centre will have noticed that the office is currently being refurbished. This work has been undertaken by FAS and is in advance of the further works which are being planned for the kitchen area and for the toilets and showers. There may be some ongoing disruption to the usage of the Community Centre, as the refurbishments take place. Users will be kept informed by the committee. The annual Craft Fair is to take place in the Centre on Sunday December 7th, and will have the same format as other years. The main body of the hall will be given over to stallholders. The committee will be running a cake sale, and raffle, as well as novelty items for children. Following the success of last year, a limited number of spaces will be available for children to sell their home-made crafts (no second hand toys, please This fair is intended solely for crafts which the child has made himself/herself). Availability will be on a first-come, first served basis. This area will be supervised by committee members, and a parent must accompany their child. Want to Help us Maintain the Enviroment? Recycling will play a vital part in everyone’s future and now is the time to get involved and do your bit. If each household participates in a simple programme which means segregating good recyclable items from the general waste for landfill then we can achieve a recycling target of 50% from domestic collections. It is achievable with everyone’s help. As customers of Barna Waste / Wheel-A-Bin are already aware a new recycling initiative has been operating in Claregalway and around other areas of County Galway for the past few months. The response to this new initiative has been very positive and we thank our customers for their cooperation. Anyone experiencing any problems or who has questions regarding the new scheme should contact the office at the numbers below. Contact names are Campbell or Christo. This recycling programme is available to all members of the public and NOT just current customers of Barna Waste / Wheel-A-Bin. There are two options available to the customer. Option 1 is that you subscribe to the wheelie bin service for a year and as part of that service you will be given free recycling bags. Various sizes, prices and payment methods are available for the wheelie bins. Option 2 is the purchasing of our pre-paid bags on an as required basis from the local shops namely Raftery’s Centra and Hughes’s. Tax relief of 20% is available with option 1. We have on sale a GREEN bag for all general waste at €4.00 and two recycling bags as displayed above at €1.40 each. These bags are filled as you need them and put out for collection when full. Anyone interested in joining this recycling scheme can contact Barna Waste or Wheel-A-Bin for more information. The collection system is simple to follow and operates on an alternate week basis. We collect general waste (ie. The wheelie bin or green bags) on one week and then recycling bags (blue and clear) on the following week and then it alternates each week thereafter. This collection system is easily followed on the calendar we have published which is available in the shops or from the company directly. Collection days in the Claregalway area are varied due to the different runs which we have. The majority of Claregalway including the main village is serviced on a Tuesday. Some areas of Cregmore are serviced on a Thursday and a small area of Claregalway is also serviced on a Monday. Any new customers will get confirmation of collection days / times before they sign up. There will be NO CHANGES in collection days / times for existing customers. Why should you sign up? Landfill space in Galway is running out quickly and therefore we need to provide a way for the public to recycle as much waste as possible. We believe this new two bag system is the easiest way to offer such a service. Segregation of waste by the householder is simple and it does become a habit once you get into the system. Recycling has to be the way forward and everyone has a part to play. We have two bags a blue bag and a clear bag. In the blue bag we look for plastic bottles, plastic cartons, tetra packs (milk cartons etc), cans, food tins. In the clear bag we look for paper, cardboard, newspaper, magazines and junk mail. All we ask is that the items are rinsed and drip dry before going into the bags. It is vital that the items are clean and dry to allow for recycling. Documentation is available in the shops or from the company directly to help everyone. These include a calendar explaining the alternate week collection and a do’s and dont’s flyer which provides a more detailed listing of what should and should not go into the recycling bags. Alternatively help is only a phone call away for anyone who does experience problems getting started on the recycling. The response to recycling in the Claregalway area so far has been very positive so anyone with any doubts about the programme ask around – relations, friends, neighbours and find out just how simple it is. This really is a simple way for everyone to get involved and do there bit for the environment. Help us to keep your environment clean. Blinds are used for mainly the same reasons as that of curtains. They help to keep in warmth, block out light, and provide an element of privacy. They can also add to the overall décor of the room, if the right style is chosen. The simple unfussy lines of blinds can be left plain to suit a modern look or dressed up for a more traditional one. In some settings, curtains may be too overpowering, so a blind would be suitable. Blinds can be divided into fabric and non-fabric types. The fabric ones can be further divided between plain and ruched. The plain includes the roller and the Roman, while the ruched includes the Austrian and the festoon blinds. The non-fabric blind’s main types are Venetian (timber, PVC, aluminium), Vertical louvered and Rolled-up (bamboo, pinoleum, split cane etc). Roller blinds are the plainest and simplest of blind. It can make an attractive and economical alternative to curtains or teamed up with a curtain to keep out the sun or to provide privacy. You could use a dress curtain which is held back permanently with a tieback. The blind will cover the window by night and during the day it can be no more than a covered pole. Most roller blinds are made from purpose-made blind fabric and come in plain and patterned fabric. You can get curtain fabric treated and made into a blind. These are best avoided where widths of fabric need to be joined, as the seams will be obvious in the finished blind. They also should be avoided in an area of high moisture. But teamed with a curtain in the right setting, it can look very well. Roller blinds can be ideal for filtering out strong sunlight from a child’s room, if it is made of black-out fabric. Roller blinds can be as plain or as pretty as you wish. They can have some form of decoration at their hems or the hem itself can be shaped. You could also paint or stencil your own pattern onto to a plain blind or take a design from another fabric or wallpaper in the room. Roman blinds are a very stylish blind. They give a smart, clean-cut finish to a window and can be hung in most any type of room, by themselves or teamed with toning or matching curtains. A Roman blind can be fitted inside or outside the window recess. It covers the window in the same way as a roller blind, but it falls into neat, tailored folds, when it is pulled up. On wider windows, two blinds side by side are better, rather than one big one, where widths of fabric need to be joined. Roman blinds work well in most fabrics and can be made in fabrics with all sort of patterns, but stripes and plain work particularly well. To decorate a Roman blind you could bind the edges all the way around in a contrasting colour or decorate the hem. A contrasting band could also be inserted just inside the side and base edges of the blind. There are two types of ruched blind, the Austrian and the Festoon, and the headings of both are gathered in the same way as a curtain heading. They are similar in appearance, but an Austrian blind is ruched only at its lower edge, while the festoon blind is ruched along its entire length. The difference between them is most noticeable when they are lowered. The Austrian blind uses less fabric then the festoon, but both blinds uses more fabric than the Roman blind. The original ruched blinds were designed for tall windows and were very popular in big country houses two centuries ago. They are now made for windows of every shape and size, but they may not be suitable for very small windows or a particular style of room. Their soft lines can create a romantic look e.g. in a floral chintz, or a sophisticated one with silk swags or a low-key style with inexpensive cotton fabric or muslin. They can be hung inside or outside the window recess, but remember if hung inside you will loose a certain amount of light, when pulled up, as they will cover one third of the glass. If fitted at different heights above the window, daylight will be allowed into the window when pulled up. Again these can be hung on their own or with a curtain. They can be lined or unlined and are best made from lightweight fabric and sheers. In sheer fabric they make a charming alternative to net curtains. You could trim them with frills and piping and have different styles of heading tape. Non-fabric blinds combine all the practical benefits of the fabric ones, but have a crisper, cleaner finish. Like fabric blinds, they allow you to adjust the amount of light entering the room and provide a screen against an ugly view or prying eyes. They also have the advantage of drawing right back from the window, to allow the maximum of light in. Good idea for tiny windows and ones with a shady outlook. There is a huge range of non-fabric blinds to choose and you should find styles to suit both your budget and décor. You can buy ready-made or made to order ones. Venetian blinds are the most versatile of non-fabric blinds. You can close them to shut out light and to give total privacy, angle them for soft shading or raise them above the window to leave a clear view. Venetian blinds come in timber, PVC and aluminium. The wooden one comes in different stains e.g. oak, cherry, maple, walnut etc. The PVC and aluminium come in a range of colours. You can also get blinds with perforated slots to provide a gentle diffusion of light when closed. Vertical louvre blinds are like venetian blinds but they turn on their sides to let in or shut out light. They can be pulled right back to one or both sides. Also come in a variety of colours. There are all sorts of non-fabric Roll-up blinds available. Finishes can include white or coloured, while other materials look good in their natural state colour-stained or with painted design. Blinds are suited to most rooms, but some types are more suited to certain situations. Living rooms and bedrooms are rooms used for relaxation and sleep, so they need a window treatment that cuts out light and in some case provide privacy. In a living room you could use Roman blinds on their own or combined with a curtain or use a roller blind with a curtain. Dress curtains set at each side of a bay window with Roman blinds can give an elegant look. But made dress curtains look as though they might just cover the window don’t let them appear skimpy. Venetian blinds can be a good choice for a large picture window. To soften the outline you again can add a curtain, valance, or pelmet. The bedroom can take most types of blind, but the fussy design of Austrian and festoon blind is best confined to this room. A child’s bedroom could be decorated with a roller blind which has e.g. animal design, but remember they will grow out of this and maybe a plain one would be better. Blinds are ideal in kitchens and bathrooms, because they can be drawn up out of the way of splashes when not in use and add a splash of colour when pulled down. Venetian blinds are a good choice, easy to clean and don’t absorb food smells and will reinforce the theme of a modern kitchen, while timber slats or rolled cane blinds will blend with a country kitchen. Non-fabric blinds don’t suffer from condensation and can be wiped down – great bonus in a bathroom. Sunrooms (conservatories) with their large amount of glass, can have extremes of heat and cold. Windows treatments need to protect both people and plants. Blinds in a dark colour will reflect the light. Fitting adjustable blinds will help with heat build-up. When the sun is hottest you can close them and at other times pull them up to let the light come flooding in. You should able to find a blind to suit what ever your needs are. Always made sure you measure and fit your blinds correctly to get the best out of them. There is plenty of help available for both fabric and non-fabric blinds. Our U-12s brought great honour to themselves and the club by winning the 2003 Coiste Peil na nÓg Division 1 North League championship for the first time in many years with a memorable and well deserved win over Corofin at Tuam Stadium on Saturday October 4th. In doing so they not only turned the tables having lost the 2002 final to the same opposition, but did so with a convincing display of attractive football. This was very evident in the second half when playing against the wind. Five points up at the break, there were some doubts as to whether this lead was enough. But Claregalway rose their game and were faster to the ball, none more so than Kevin Hussey at centre back, Michael Evans and Eoghan Commins. After successfully defending a 10-minute spell of Corofin pressure early in the second half Claregalway moved upfield along the right-wing for a peach of a goal by Jason Byrne. This gave them a lead of 8 points and their hands were all but on the trophy from there on. From the throw-in, Claregalway got off to a flying start and had their large support in full voice within two minutes when Daniel Cunningham sent in a high ball from outfield which dipped under the crossbar into the net despite the best efforts of the Corofin goalie. The same player, Robert Dooley and Greg Cunningham (free) each pointed for a lead of 1-3 to no score after 10 minutes. A number of wides from scorable positions then followed. This spell of dominance was suddenly broken when Corofin broke upfield for a goal in the 15th minute. They looked like scoring further goals but were denied by a series of brilliant saves from Stephen Nally and good defending by Ronan Badger, Hubert Newell and Donal Conroy. Claregalway recovered and points by Robert Dooley and Greg Cunningham (free) left the scores 1-5 to 1-0 at half-time. Corofin pressed hard for scores on the resumption including a shot that just skimmed wide of Stephen Nally’s right hand post. Justin Brennan at corner back came into the game in a big way with some fine interceptions and clearances to deny the opposition a path to goal. Robert Dooley found the net 5 minutes from time and the same player added a point before the end to complete Claregalway’s tally. This win crowns earlier successes in the City leagues; the club has already captured U-11 and U-12 City leagues 2002 and 2003 back to back; U-13s remain in the shake-up for honours also. The club conveys its tributes to the managers Jimmy Gavin, Geoff Diskin and Ray Dooley for all their time and work with the panel and most importantly to the parents for turning out the players so well for training and games. Thanks to Johnny Mullins of Cregmore Construction for sponsoring Track Suites and Gear Bags for both u-12 Panels. We express our appreciation to Coiste Peil na nÓg Gaillimh for running off the fixtures so efficiently within the space of six weeks. Team: Stephen Nally, Hubert Newall, Ronan Badger, Justin Brennan, Donal Conroy, Kevin Hussey, Eoghan Commins, Greg Cunningham, Michael Evans, Diarmuid Gavin, Connor Costelloe, Jason Byrne, Daniel Cunningham, Robert Dooley, Peter Divilly, Dale Conlon, Keith McDermot, Ciarán O’Flaherty, Matthew Moran, Greg Noone, Michael Noonan, Donal McGreal. Our U-12 Bs gave a fine display of teamwork in winning the Division 4 League at Pearse Stadium on Sunday last. The winning margin of 5 points scarcely reflects the extent of their dominance from start to finish. Three early points by Peter Dolan who was one of the best forwards on the day, Barry McDonagh (free) and Cian Brady settled Claregalway down and they proceeded to play fast direct football both through the middle and up the wings. Peter Dolan scored two further points to leave the scores at 0-5 to 0-2 at half-time. Stephen Fee opened the scoring in the second half with a point after 10 minutes. This was followed by a number of likely chances which on another day would be converted and it was 10 minutes from time the Phillip Noone got the insurance point. A few minutes from time Stephen Fee completed Claregalway’s tally with a point from a free. The trophy was presented to team captain Ryan Harrington by John Leen, Chairman Coiste Peil na nÓg Gaillimh. This U-12 B win breaks fresh ground for the club and coming so quickly after winning Division 1 North speaks for itself as regards the players output in this grade in response to the inputs of the team management, Peter Lynskey,Johnny Mullins, Geoff Diskin and Ray Dooley. Team panel: Eoin Clarke, Ryan Harrington, Emmett Feeney, Philip Doyle, Niall Mullins, Paul Jacabson, Eoghan McDonagh, Mathew Keating, Brendan Joyce, Eoin Lynskey, Mark Walsh, Barry McDonagh, Stephen Fee, Cian Brady, Peter Dolan, Philip Noone, Damian Burke, Cormac Whelan, Jonathan Crowe, Andrew Hall, Jonathan Healy, Stephen Devaney, Daniel Kelly, Alan Byrne, Dara Kirwan, Ashley Hurney, Pat Loughlane, Kieran Harte, Sean Diskin, Joe Keighrey, Darren Duggan, Paul Costelloe and Thomas O’Keeffe.